How to Install TWRP Recovery On Realme U1 - COMPLETE GUIDE! How to Install TWRP Recovery On Realme U1 – COMPLETE GUIDE! In this guide you will learn How to Install TWRP Recovery On Realme U1. After huge success of Oppo Realme 2 and 2 Pro, Oppo Sub brand has launched his new smartphone named Oppo Realme U1. This is the world’s first phone which comes with Helio P70 Processor. Realme U1 is a amazon exclusive phone. This Time realme has madea selfie centric phone where you will get 20 MP of front camera with LED flash which can amazing photo in low light. If you have purchased Realme U1 and you are planning to root your device, So first of all you need to install TWRP on Realme U1. Here We are Proving Some Step And Basic Guide to Install TWRP Recovery on Realme U1. Android is a versatile OS which is ever made and it is getting better and better with the time. There is no limit how much you can tweak up with your phone android os. But unfortunately, it can’t be done on stock OEM device. Manufacturer only tends to give some limited feature which is used by every normal smartphone users. Android users can root their phone to get most out of it. Rooting is not difficult as you think. Rooting Realme U1 will give you some special benefits like you can install special apps, flash custom ROMs, you can streamline your phone performance and many extra features. In easy words, If you want to get real performance of your Android phone then first you have to root your smartphone. But befor rooting you have to install any custom Recovery like TWRP on your phone so you can easily flash rooting files like SuperSu & Magisk. Now here i am going to share with you complete guide on How to Install TWRP On Realme U1. TWRP (‘TeamWin Recovery Project‘) is a custom recovery available for all android devices. It replace the android stock recovery and it comes with much more feature as compared to stock recovery. It is a third party custom recovery which allows user to install Third party Software3 like Custom ROMs, kernels, and mods. In addition it also allows user to wipe & flash device partition. With the assistance of this, you’ll be able to take backup of your mobile and simply restore it later anytime. The Best thing about this is it is touch-enabled custom recovery for Android devices. SO, it is easy to use custom recovery for any users. TWRP was led by Dee’s Troy, along with there are many developers who helps in maintaining individual device support. What are the Benefits of installing TWRP On Realme U1? You can flash Custom Rom with the help of TWRP. After installing TWRP you will be able to root Realme U1 without Pc. This is one of the Easy to use Xposed Modules. You can easily root and unroot your phone using TWRP Recovery flashable zip SuperSU. You can take full backup of your android stock rom and easily restore it anytime. Wipe the existing firmware to give the new system a clean slate upon which to install. Flash the image file using TWRP Recovery. Here is the quick specifications of newly Launched Realme U1. Processor: This phone is powered by Helio P70 Processor. Helio P70 chipset was launched last month in all over the world and Realme U1 is first phone which comes with Helio P70 Processor. RAM: Realme U1 comes with 3GB or 4GB RAM variants. Internal storage: The newly launched Realme U1 comes with 32 GB as well as 64 GB internal storage. Rear camera: The realme U1 comes with 16MP+2MP dual primary cameras at the rear-end. Front camera: Realme said in there launched event that it is a selfie centric phone. That’s the reason you will get 20 MP Selfie camera with LED Flash on your front side which can take amazing pics in Low light condition. Battery: The device has a 4,000mAh battery. Software: Realme U1 run a version of Android 8.1 Oreo. 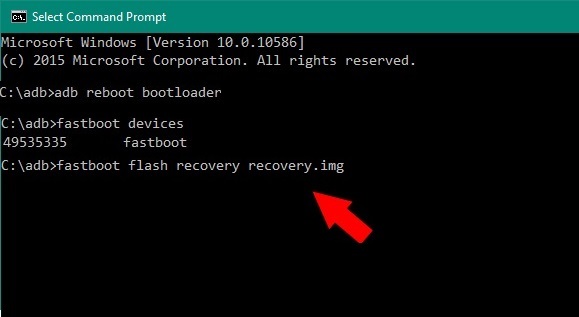 To Flash a custom recovery you need a computer or laptop. Don’t forget to take full Backup your device just in case if you need it later. Download TWRP recovery for your android phone. Note :- This guide is only for Realme U1. So, Please Don’t try to perform this on any other Smartphone. How to Install TWRP Recovery On Realme U1? Now as you have enabled Developer option on Realme U1. Now you need to go back to setting and there you will find a new option of ‘Developer option’. Just go to developer option and enable OEM unlocking. Now make sure you have unlocked bootloader of Realme U1. If you have not then read this guide on How to unlock bootloader of Realme U1? Step 4 ~ Setup ADB & Fastboot On Windows. You can read this guide to properly setup ADB and Fastboot On Windows. TWRP has not been released For Realme U1 yet. Step 7 ~ Open a Command Window in the Right Directory. Step 8 ~ Connect Your Phone To Pc / Laptop. Now connect your phone with PC laptop Using USB cable. Step 9 ~ Reboot your phone into Bootloader Mode. Next you have to reboot your smartphone into Bootloader mode – For that just type the given below commands in Command window that you opened. Now your device will be boot into Bootloader mode, If not then make sure that your cable and usb drivers have been installed properly. Now it’s time to install TWRP recovery on Realme U1. Enter the following command to flash TWRP files. Now as you have successfully installed TWRP on your phone, All you have to is enter the given below command to reboot your realme U1. Congratulations!! You have successfully installed TWRP Recovery on Your Realme U1. Now just reboot your device and enjoy your device. Now as you have installed TWRP on your phone now you can root Realme U1 and enjoy using your device into the next level. So this was our guide on How to Install TWRP Recovery On Realme U1. We hope this guide helped you in Installing TWRP on Realme U1. If you have still any question or queries related to this article then you can comment down below. Please Share this article on Facebook and Whatsapp .